Although the court didn't similarly decide to use immigrant instead of alien, that may well be due more to the fact that alien is a frequently used term in the context of immigration law than to any view about the term's possible offensiveness. The first case mentioned in the footnote, Texas v. United States, is the decision by the U.S. Court of Appeals for the Fifth Circuit that had enjoined the DAPA program (Deferred Action for Parents of Americans and Lawful Permanent Residents, which was related to but separate from DACA, which stands for Deferred Action for Childhood Arrivals). That decision used the term illegal aliens rather than undocumented aliens, but like Tuesday’s DACA decision, it explained its choice of terminology. 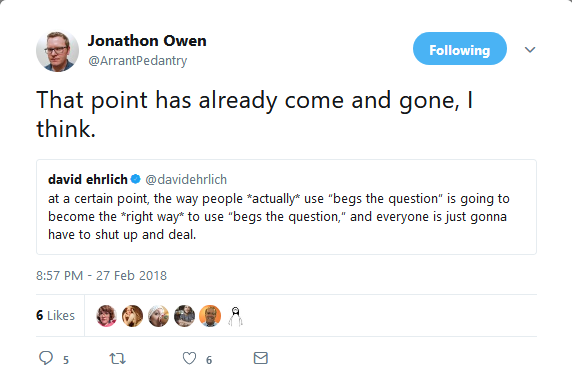 At Arrant Pedantry, Jonathon Owen continues the conversation about begs the question (Skunked Terms and Scorched Earth). Citing my previous post Begging the question of whether to use "begging the question", Jonathon describes me as writing that "the term should be avoided, either because it’s likely to be misunderstood or because it will incur the wrath of sticklers." I wouldn't put it that way; I did quote Mark Liberman's statement to that effect, and I did note that I had, in an instance I was discussing, decided to follow that advice, but I don't think I went so far as to offer advice to others. As it happens, I'm meeting Jonathon for lunch (and for the first time) later today. I'm in Utah, where the law-and-corpus-linguistics conference put on by the Brigham Young law school was held yesterday, near where Jonathon lives. So I will have it out with him over the aspersion he has cast on my descriptivist honor. There is a great discovery still to be made in Literature, that of paying literary men by the quantity they do not write. Nay, in sober truth, is not this actually the rule in all writing; and, moreover, in all conduct and acting? Not what stands above ground, but what lies unseen under it, as the root and subterrene element it sprang from and emblemed forth, determines the value. Under all speech that is good for anything there lies a silence that is better. Silence is deep as Eternity: speech is shallow as Time. Paradoxical does it seem? Woe for the age, woe for the man, quack-ridden, bespeeched, bespouted, blown about like barren Sahara, to whom this world-old truth were altogether strange! In MS Word, buried deep in File|Options|Advanced|Compatibility Options|Layout is the option to check 'Do full justification the way WordPerfect 6.x for Windows does'". If you use full justification, your document will look ugly unless you check that box. Does that qualify as a form of nerdview? Begging the question of whether to use "begging the question"
The tweets above have extra salience for me, because I used begs the question in the traditional way ('assumes the answer to the question in dispute') in my most recent post on LAWnLinguistics. I did so with some trepidation—not because I was worried that someone would think I was using the phrase wrong, but because I was worried that someone would think I was using it in the 'raise the question' sense and wonder what the question was that I thought was being begged. In today's Dilbert strip, Dilbert is confused by why the company mission statement looks so different, and Alice diagnoses what's happened: the Elbonian virus that has been corrupting the company's computer systems has fixed all the grammar and punctuation errors it formerly contained. There has been no glimmer of light from the Palestinian Authority since the Oslo Accords were signed, just the usual intransigence that even the wider Arab world may be tiring of. Yet the West, the EU, nor the UN, have never made the PA pay a price for its intransigence. On Saturday, in his first response to Charlottesville, Mr. Trump condemned the violence "on many sides." Then he lapsed into the passive voice, expressing, as he has before, a sense of futility that the divisions between Americans would ever be healed. "It's been going on for a long time in our country," he said. "Not Donald Trump, not Barack Obama. This has been going on for a long, long time." This incompetent, floundering president, who has never previously had to run an organization and is revealing that he is no good at it, is guilty of so many things that could have been mentioned. But passive voice? Asking whether "the divisions between Americans would ever be healed" is passive voice, but that's not Trump, that's Landler, who's the accuser here. "It's been going on for a long time in our country" is not in the passive voice. Mark Landler is one more case (I have literally lost count) of someone who writes for a major print source and pontificates about other people's grammar but doesn't know the difference between active and passive. With a larger majority she can more easily stand up to her ultra-Eurosceptic backbenchers, some of whom seem actively to want Britain to crash out. An amusing slip in the Daily Mail (online here), in an opinion piece by Dan Hodges on the decline of the Labour Party and its singularly unsuccessful leader Jeremy Corbyn. Hodges says that "anyone who thinks Labour's problems began on September 12, 2015, when Corbyn was elected, are deluding themselves." It's unquestionably a grammatical mistake, of course. Not about pronoun choice, but about verb agreement. The President thanked his Vice-President, Joe Biden, and the rest of the people who had made possible his time in office. And here, too, was a contrast with Trump, who has yet to demonstrate an ability ardently and earnestly to praise a person other than himself. To demonstrate an ability ardently and earnestly? Vinson, are you quite sure you didn't mean that what Trump hasn't yet demonstrated is that he can ardently and earnestly praise a person other than himself? I'm afraid the flaunt/flout distinction may be a lost cause. Yesterday in the UK parliament three Labour Party whips voted against the instructions they were supposed to be enforcing on behalf of the leader of their party, and three times already this morning (the radio has been on since 5:30) I have heard a parliamentary report on the BBC's flagship Radio 4 program Today in which a reporter referred to party whips "who were supposed to impose party discipline, rather than flaunt it." A string of purchases of A380s, starting in 2008, helped traffic to more than double to 51m in 2015.